A huge ice sculpture of the London skyline, including a miniature version of the London Eye, is being carved out on the Southbank. The artwork is being created from large chunks of ice, and should be finished by around 6:30pm. Scientists have created the world's first battery made entirely of Brussels sprouts which is being used to light an 8 foot Christmas tree. A battery made entirely of Brussels sprouts is being used to light an eight foot Christmas tree in central London. The battery was created by a team of scientists and engineers from The Big Bang UK Young Scientists and Engineers Fair and is being used to light up part of London's Southbank. It was created using five power cells, each holding 200 sprouts, producing 63 volts from the 1,000 Brussels sprouts. “I remember my excitement when, in 1960, I was invited to join the team of architects at the LCC, who were working on the design of the proposed new concert hall and art gallery on the South Bank. The following year, when the project had its public launch, one member of the group expressed our ambition that there should be other facilities on the South Bank ‘so that it becomes alive ... rather than just a cultural centre’. "Some seven or eight years later I again experienced excitement when the complex opened and I was able to wander from the riverside walk, over the walkways and terraces and through (and over!) the buildings – but there was something still missing. "This feeling persisted for over 40 years until a warm Spring day – 22 April 2011 to be exact – when I revisited South Bank, found it teaming with people, children and adults, some relaxing on a newly-installed grassy lawn on the top of the Queen Elizabeth Hall Roof and others dodging through the fountain on the terrace below. "Activity everywhere. So many people just enjoying themselves. Architects plan to create a new glass foyer and pavilion. Credit: Fielden Clegg Bradley Studios. The Southbank Centre says that the development will create "a world-class cultural centre for the 21st century" and address current problems with access and back-stage facilities. “Southbank Centre’s proposals will transform a sad and unwelcoming part of the site into the centre piece of the cultural quarter which will offer the residents of Lambeth and Southwark many more opportunities to enjoy the arts”. An artist's impression of how the revamped site might look from Hungerford Bridge. Credit: Fielden Clegg Bradley Studios. A new Central Foyer - a glazed atrium that will cover the space between the Queen Elizabeth Hall and Purcell Room, and the Hayward Gallery. A new Glass Pavilion - a venue "floating" on top of the Central Foyer, designed to hold a full orchestra of 150 and choir of up to 250 plus small audience. A new 'liner' building along Waterloo Bridge, including a national literature centre and two restaurants. 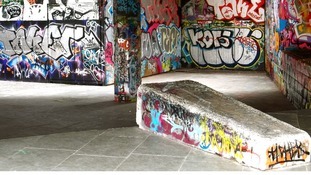 New venues for gigs and dance performances in the undercrofts - the spaces underneath the complex. The plans involve a transformation of the Festival Wing. Credit: Fielden Clegg Bradley Studios. The Southbank Centre has unveiled plans to transform the complex around the Queen Elizabeth Hall, the Purcell Room and the Hayward Gallery. The proposals include the refurbishment of the existing 1960s buildings and the creation of a new glass pavilion and a central foyer. Passengers using Blackfriars station will now benefit from more than 700 extra trains every week. It's thanks to two new platforms and the completion of engineering work on the central London section of the Thameslink route. There will now be 700 extra trains every week at Blackfriars station, which has been undergoing a massive refurbishment programme for the last four years and will be complete by the end of this year. Two new platforms will serve both north and southbound trains as part of the completion of engineering work on the central London section of the Thameslink route. Keith Jipps from First Capital Connect says: "We'll have 40% more trains serving the station once we reopen at night and weekends. This and the new south station entrance, suddenly makes Blackfriars a great destination for art lovers and theatregoers."